Posted on November 20, 2017 at 7:24 am. 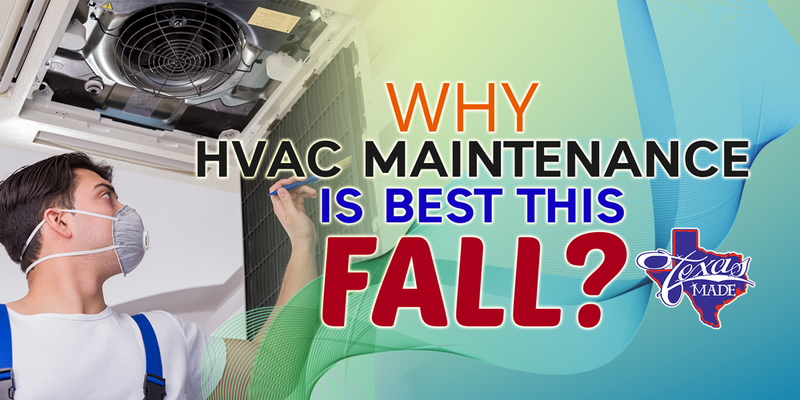 You might be wondering why of all the seasons, fall is the best time to hire a qualified service company such as Texas Made Air Conditioning and Heating to maintain your heating and cooling units. Well, here are just the reasons why. It’s not that hard to get in touch with HVAC contractors. Let’s face it, contractors are really hard to find during peak seasons. Fall doesn’t call for too much dependence on heating and cooling system, so HVAC contractors are less busy this time of the year. When you request for emergency services during winter, you still need to wait 3-5 days before a technician knocks on your door. At fall, it’s the contractors who hunt for clients, so expect in minutes or hours, services are given to your HVAC units. It saves you from expensive emergency HVAC services. Fall maintenance is a good preparation for the cold wave, where you’ll be in need of your HVAC system 24/7. Before the peak temperature, you’ll be able to identify problems and provide solution before they complicate everything. Since maintenance and small repairs cost less than emergency call services and system replacement, you’ll definitely end up saving yourself from great expense. It prepares your system for the next cold wave. Fall is the best time to see if your heating and cooling system is good to go this winter season. Testing your units ahead of the peak temperature will save you from unexpected system failure and discomfort during the coldest time of the year. Aside from cutting some expenses, it will definitely give you peace of mind. We can’t stress the value of fall preventive maintenance enough. The last thing you want to experience is being caught up in the freezing temperature with a failing furnace. The best way to be sure not to miss an annual fall maintenance is to enroll in a maintenance agreement with your trusted heating and cooling contractor. At Texas Made Air Conditioning and Heating, you’ll enjoy priority services, great discounts and many other advantages just by signing up on our maintenance contract.